CB hosts state game Saturday, October 27 at 1 p.m. 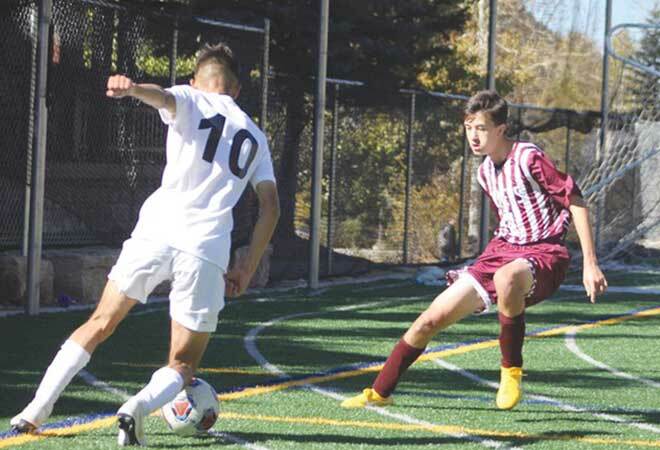 The Crested Butte Titans soccer team closed out the regular season on a high note with a 3-1 win over the Telluride Miners on Saturday, October 20. They finished the regular season with a record of 12-1-2, the league title. They are the number one seeded team at the 2A state tournament and are set to host a state tournament quarterfinal game at Rainbow on Saturday, October 27 at 1 p.m.
Telluride is notoriously strong on their home turf and the Titans knew they needed something extra if they wanted to come out of the day with a win and the league title and maintain their number one ranking in the state. “We focused on keeping the intensity high, being confident and showing them that we are number one for a reason,” says senior captain Tommy Linehan. Hopes to maintain their standing were almost immediately dashed in the first 15 minutes of the game as the Miners took immediate control with high-paced play and an overwhelmingly fast transition game to push the Titans back on their heels. The Miners seized on their advantage 12 minutes into the first half, scoring on a set play and the game looked to spiral out of reach of the Titans before they could even catch their breath. Led by the back line of the Titans defense, the Titans soon started to climb out of their hole and wake up to the pace of play. Zane Reda did his part as a dominant center back with support on the outside from Owen Berv and Finn Smith, allowing the Titans midfield to get their feet underneath them. 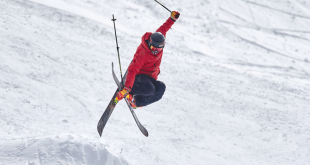 The ultimate swing in momentum came in the 30th minute when Dagan Schwartz turned to hit a bouncing ball from 35 yards out, floating his shot over the Telluride keeper and into the back of the net. “Dagan’s goal gave us some confidence but also we started playing relaxed and making the simple open passes,” explains Linehan. Five minutes later the Titans capitalized on a throw-in as Carlos Franco scooped up the ball for a quick toss to Gaby Marmolejo and Marmolejo flicked the ball past the oncoming goalie for a 2-1 lead heading into halftime. The Miners looked to take back the momentum in the second half but net minder Slater Weil came up with a couple of big saves, both Linehan and Nathan Miller started winning the 50/50 battles and Franco found room to move with the ball and look up-field. 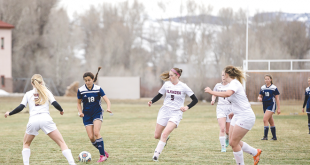 The Titans held off an initial surge from Telluride and slowly took back control of the game culminating with another goal. A push wide opened the middle up for Franco who collected a pass and slipped the ball through to Schwartz on the run. The Telluride keeper sprinted out to cut off the angle but Schwartz calmly tapped it past him and into the corner for a 3-1 lead with 18 minutes left. The Miners did have a couple chances down the stretch but Crested Butte remained composed to keep their lead intact and seal the win in the end. “It couldn’t have been better,” says Linehan. They now have their hands full with the state tournament on tap. Win and advance, lose and the season’s over. The game and level of play certainly ramps up as the Titans start facing teams from the Front Range. The Titans are set up for success as they are the number one seeded team in the state and get a bye through the first round. They are scheduled to host a state quarterfinal game on Saturday, October 27 at Rainbow field, time to be determined later this week. They will face either Heritage Christian out of Ft. Collins or Loveland Academy out of Loveland. If they win, they head to Denver on Saturday, November 3 for the semifinals.